Since its inception, the University has realized that the current pace of development and the specificity of medicine today, such as the introduction of molecular and personalized medicine, require that we train doctors with sufficient knowledge in different fields of science. Therefore, the General Medicine Educational Program is based on an approach that provides high-quality medical training from the top specialists in different fields of medicine with a comprehensive education in natural sciences, social and economic disciplines, mathematics and humanities, and students’ participation in research projects. The idea behind the introduction of this specialty is to train highly qualified medical doctors or researchers with expertise in clinical disciplines who will possess all the research skills and knowledge of natural sciences that are required for biomedical research. The objective of the specialized clinical training is to prepare medical doctors with necessary behavioral and critical clinical skills for providing medical care not only for urgent but also life-threatening conditions as well as working on prevention, diagnosis, treatment, and rehabilitation. Upon its completion, graduates are prepared to pursue a career in the areas of research, education, and science, ranging from all sorts of fields such as preventive, diagnostic, therapeutic and organizational; they can continue their education through an internship, residency, or doctoral program in post-graduate professional education programs. For the first two years of study, all lessons are held in English. During this same period, students take an intensive Russian language course. 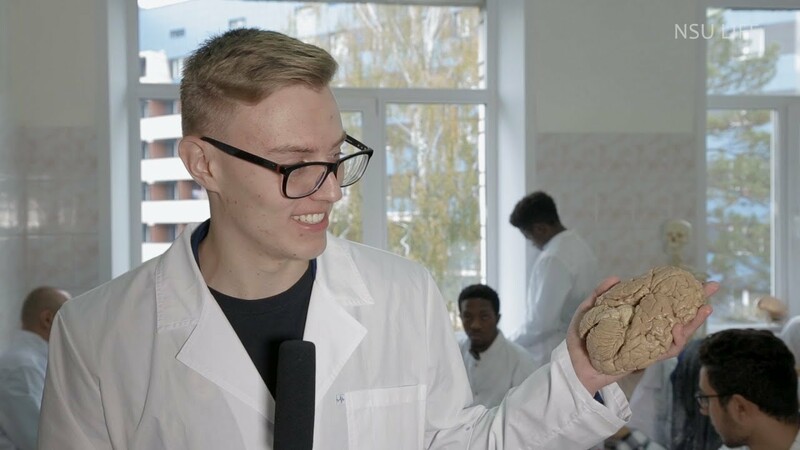 Starting from the 3rd academic year, the course of study is organized so that all the modules are taught in Russian, giving the students the opportunity to communicate with real patients and their respective supervisors. If you require that the Novosibirsk State University send an invitation to apply for a student visa, the deadline for the initial application is May 19, 2019. I am a proud citizen of my country Nigeria and came from a family of 5 children, 2 boys and 3 girls. Since childhood I've been passionate about a future career in medicine which is the reason why I am here in Russia, to fulfill my ambition. I heard about Russia from different people in my country and I always wanted to be here someday. It is a great opportunity that not everyone is privileged to have - to be at NSU. When I started studying at NSU I was a bit lazy at first but after a while, I got into the habit of regular reading and hard work, this is the impact that NSU has made in my life. The first and most serious problem that I faced when I arrived in Novosibirsk was the language barrier. Not so many people here speak English, which complicates communication. The only people I could talk with were my fellow students and foreign students. But time passed, and I slowly began to learn Russian, it came naturally. Now, after a year, I understand very well spoken Russian. The second problem that I had to face when I arrived was of course the weather. Where I come from, we are surrounded by a savanna and enjoy the highest temperatures. As a result, cold weather caught me by surprise. However, with the support of my Russian friends I got a lot of tips on how not to freeze. Now I am quite well adapted to winter, thanks again to NSU students. Before coming to Russia, I was constantly hearing that everyone here drinks, so my parents begged me to be sober in this country. Also, I have almost been led to believe that racism flourishes in Russia. But I must confess that Russians are the friendliest people I have ever met. No wonder I feel at home here. However, it is undeniable that there are a lot of differences between Russians and Zimbabweans. The most interesting thing in my country is that a man and a woman cannot hold hands or kiss in public without facing arrest. Here, couples kiss everywhere no matter if it is proper or improper. By the way this summer, as I was on holidays at home, I witnessed the arrest of a couple. NSU is my first University and I am happy to be a part of this big family. Among University traditions, I am fascinated by the student custom to make a fire, sing, and dance all together on the banks of the Ob Sea. I have never been as happy as I am now, because I am aware that I am getting an invaluable experience participating in NSU life and life in Russia as a whole.